iPhone apps | What Car? iPhone apps make a great gift - especially the free ones - and you can send them as a gift from the App store through your iPhone. Here are three of our favourites. 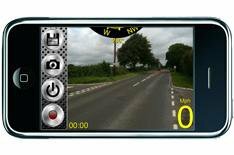 The perfect app for any driver or track day fanatic, Witness Driving creates a video record of your car journey or track day experience viewed through the windscreen. The vehicle's speed and location are also displayed on the screen. Use the app in case of mishaps on the road, or to create a record of hot track day laps. Videos can be easily shared through Facebook, YouTube or email. A great gift for all drivers, but especially helpful for the newly qualified. Once they've entered the make and model of their car, the app uses the phone's internal tools to measure fuel economy, speed and miles covered. It will also give a journey score from 1-100; the higher the score, the more efficiently they're driving. Users can even upload trips to DriveGain's website, allowing them to evaluate performance over an extended period of time. Not the most exciting of presents, it's true, but one that'll still be in use long after the tinsel's been taken down. The AA Parking App locates parking spaces that are closest to the user's location, or at a destination of their choice. It'll reveal free and paid parking, along with the amount you'll have to pay and a host of other information, too. It's a must-have addition to the on-road arsenal of any driver.